The paintings of Kevork Cholakian ask that you pay attention — not just to their strongly defined shapes and resplendent colors but to the marvelous world they convey. Exquisite contours and rich tonal layering form still-life subjects that beguile the viewer with both the command of their design and the fullness of their actualization. Reinforced by round panels, plump heirloom tomatoes of unexpected hues are isolated against backdrops of a contrasting saturated color. The outline of each tomato diverges from and plays with the primary circular shape, while ribbing, like puckered cloth, radiates from the capping stem. 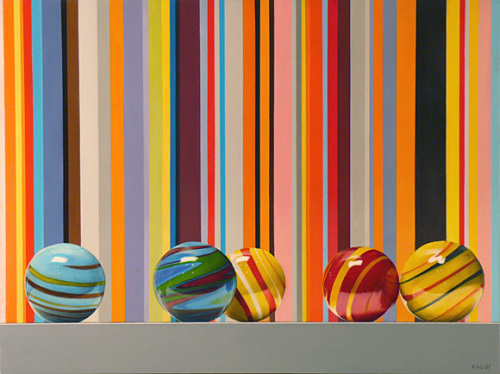 Three spherical marbles enhanced with wrapping ornamental spirals are arranged in paced sequences against bright, rhythmic stripes. Partaking of the same palette as these vertical bands, the marbles read as distinct and tantalizingly tactile by virtue of white highlights that suggest shiny, smooth glass. Cholakian raises familiar objects to a magnitude above their ordinary station with his powerful minimalist compositions in combination with lavish descriptive rendering. Weaned on Pop Art and inspired by the Dutch Old Masters, Cholakian likewise revels in the things of everyday life as is characteristic of those styles. An affinity for both of these dissimilar approaches lends a complexity to his deceptively simple artworks in which formalism and realism commingle. Bold abstract elements and organizing principles are combined with sumptuous visual information. Broad, flat areas of color akin to those of high-modern color field painters, like Gene Davis and Frank Stella, reside with intricate builds of translucent oil paint that look all the way back to the 15th-century Flemish visionary, Jan Van Eyck. The hard edges of his deft outlines reconcile with the sharp focus of acutely observed details. 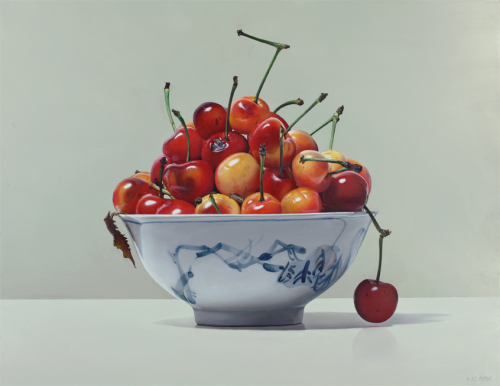 Simultaneously restrained and excessive, conceptual and perceptual, Cholakian’s still-life paintings maintain a dynamic equilibrium in a way that intensifies the viewer’s experience, such that unassuming subjects like cherries, rocks, peppers, and papayas seem more illumination than mere illusion. Yet his portrayal is not so much idealizing as granting objects their dignity — the perfection of imperfection. With access to Los Angeles’ four-seasons produce markets, Cholakian seeks out fruits and vegetables possessing the most character, which often means marked by a defect or oddness. Whereas decay is usually associated with loss or deformation, his eye discerns a curious metamorphosis, and his still-life subjects increase in vitality and magnificence. In this delight in anomalies and the effects of natural processes, Cholakian’s sensibility corresponds to Zen aesthetic tenets, including the qualities of transcending the conventional and energized calm. Similarly, the directness and clarity of his paintings are the result of meticulous planning and painstaking yet contemplative execution involving up to twenty layers of high-quality Old Holland oil pigments. 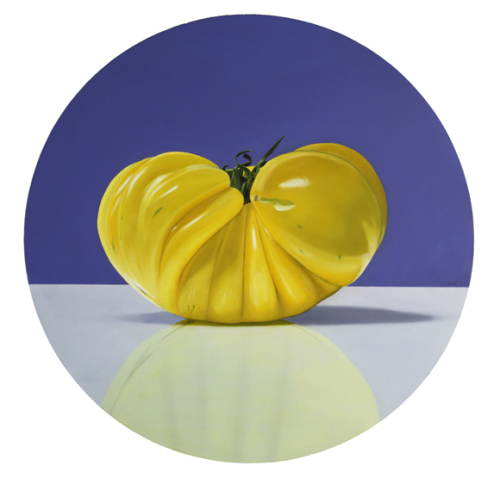 Subjects are mindfully placed and individually positioned with understated asymmetry that is delicately balanced. Accordingly, in his obsessive color selection, Cholakian avoids the habitual and offsets heightened, often atypical color with striking, off-centered contrasts. In time, the blistered pepper will wither, the dangling cherry will drop, the marble will roll away; but in Cholakian’s paintings its passage is frozen in perpetual impermanence. While temporality is suspended, pictorial space confounds. Subjects are perched on a table-like surface, but it’s unclear as to their surroundings. Composed of single or multiple colors, backgrounds may be an extension of our space or may be simply negative space; throughout the composition, we try to settle into an easy reading of two or three dimensions, but no single determinant prevails. Even neutral tones serve to separate the objects from our grasp. Visually cunning, Cholakian uses reflections and refractions to create ghost forms and ambiguous relationships: substantial, ripe tomatoes seem to levitate; marbles appear to be strangely locked in place. His choice of subjects often provides ample opportunity to suggest that ambient light is glancing off their surfaces. Yet the ambient light in fact passes through the layers of oil paint creating an internal glow, the effect of which is as if pure color found a way to manifest.